[New for 2019] Guess what? There's not one, but two oat milk ice creams coming out this year. This makes me happy because my son is quite partial to his vanilla oat milk so I think this might actually be something he enjoys. Oh, also, we're cheating and trying two of the flavors at once. There is a third flavor, peanut butter & raspberry, but for safety we left that one at the store. 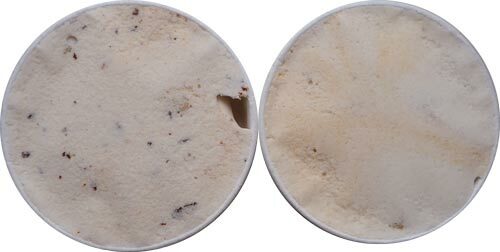 Oatmeal Cookie: "chewy" oatmeal cookie dough with sweet brown sugar and a hint of cinnamon blended in smooth oatmilk frozen dessert. Caramel Apple Crumble: apple, cinnamon, and brown sugar combine with a caramel swirl in creamy oatmilk frozen dessert. My son was very excited to try these. For context, my son loves oat milk. 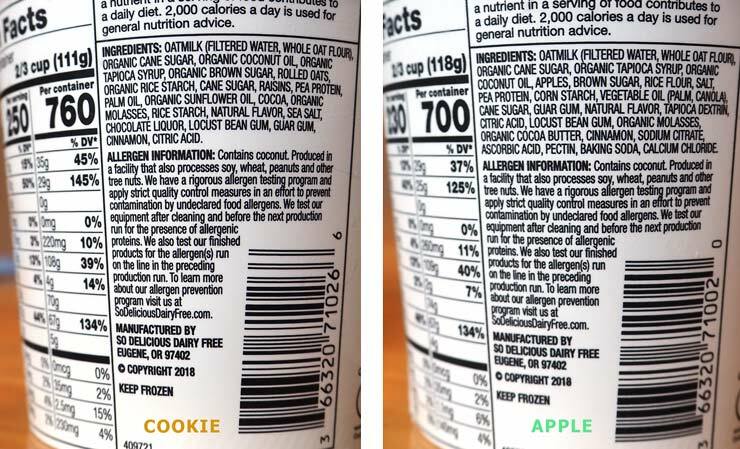 In particular, he has spent his entire life drinking either water or Pacific Valley vanilla oat milk because of his food allergies. He doesn't want juice and he doesn't like any of the other alternative milks. He doesn't even like any other brands of oat milk. He won't even drink the plain Pacific Valley oat milk, it has to be vanilla. Anyway, I was hoping these would click with him since he hasn't eaten any ice cream since vanilla rice dreams stopped being available in our area. That's not a terrible opening shot. It's subtle but has potential. Ok, you've got my attention now, that's got a nice look to it. Sure, the tiny apple cubes are a little strange, but better to see a bunch of tiny cubes then just one or two large pieces (that would probably taste weird frozen anyway). We try the cookie one first, and then the apple. Unfortunately, my son is not a fan... but I think he's crazy! Hehehehe, I kid I kid. An opinion is just that, an opinion, and he's entitled to it (plus he doesn't exactly have much frozen treat experience). My thoughts? This is easily one of the better non-dairy alternatives that we have tried over the years. There's usually either a really weird texture or a really weird taste that comes with these, but this is actually pretty respectable (and you know how picky I am). 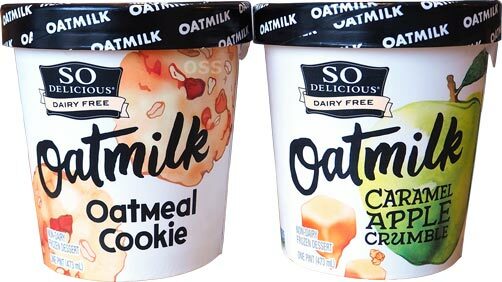 I wouldn't give up regular ice cream for these, but I've tried a few different oat milks, and this tastes better than that. 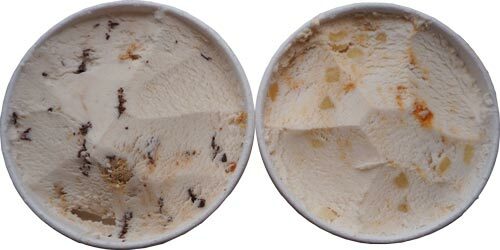 On Second Scoop: Ok, I haven't had these since we tried them two weeks ago but I just dug in to the oatmeal cookie and I still say these are pretty good. There's just a bit of that weird (somethin') that I've gotten with other non-dairy stuff, but they've thrown in a decent amount of flavor and the texture is decent to make it worth it. Oh, please don't take my "decent" as an insult, regular readers know this is a compliment from my overly picky self. If you are tempted to try these, I definitely say go for it! I'm off to convince my son to give these another shot! Thanks for reviewing these! I have a nonverbal, autistic son with special dietary needs. We just recently found new Quaker oat milk. I'm happy to hear your son prefers vanilla so I can give that a whirl first. I was looking at plain versus vanilla, but I was not sure what mine would prefer. I always feel for my son because, while a lot of people now are "lactose intolerant," I am "lactose enthusiastic." I will have to seek out these new ice cream alternatives! Ha, we have much oat milk experience. My son prefers the sweeter and tastier pacific valley vanilla oat milk. A lot of the ones hitting the market now carry the "unsweetened" tag which he is not a fan of. We tried adding both sugar and vanilla syrup to the plain ones but he liked neither (and it seems wrong to mix vanilla extract in to a child's drink). One thing I've noticed is that I don't think he likes the oat milks that have oil in them. The other thing to watch out for is protein. His favorite one actually has 4g of protein per serving where as the others have 1 to 3 grams (3 is fine, but 1??). I'm glad there are alternatives out there, I just wish he liked one of them while his is out of stock. Thanks so much for all of that information! It sure is helpful!